The Dell Streak 7 – the curiously sized tablet that has split opinions – is now available in its Wi-Fi only flavour for £299 direct from Dell. 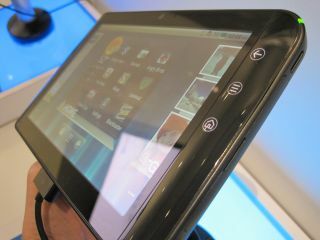 The Dell Streak 7 brings a 7 inch screen, a 1GHz Tegra 2 dual-core processor and 16GB of internal storage. The improved processor and that larger screen give it some obvious benefits, although some may question the meagre 800x480 display – as mentioned in our hands on: Dell Streak 7 review. Other specs for the tablet include Gorilla Glass to make it that little bit harder to smash your toy's face, Adobe Flash 10.1 support and front and back cameras (1.3 and 5MP respectively). Dell has tried to position the Dell Streak 7 as a 'family tablet' although it is difficult to know exactly why a family would plump for the 7 inch screen rather than a bigger version like the Dell Streak 10. However, a price point at a sensible £299 direct from Dell might test the waters a little, and it will be interesting to see if this is an Android small-form factor tablet that can make an impact.